A twice-monthly pairing of book covers that just seem to go together. Click on any of these images to open up an enlargement. 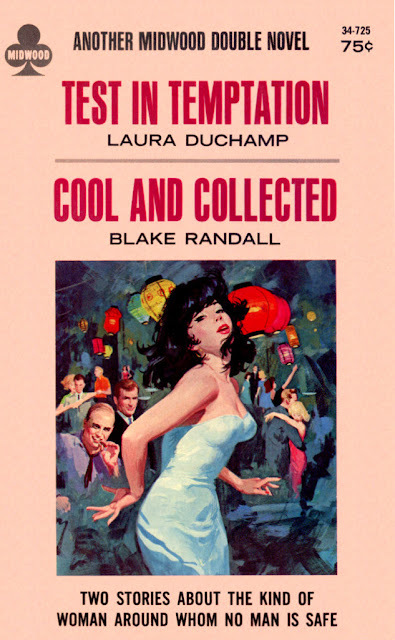 As I’ve mentioned on this page before, it was quite common during America’s paperback heyday of the mid-20th century for publishers to recycle cover illustrations from one book to the next, figuring that readers wouldn’t recognize such budget-saving thievery ... or at least wouldn’t care overly much about it. Less frequently, artists were commissioned to refashion their original paintings for a second (or even third) use. That was the case, for instance, with Ernest Chiriacka’s artwork for 1961’s By Love Depraved and Lou Marchetti’s cover image for 1955’s The Wanton Hour. It was apparently also what Robert Maguire did in order to supply the two attention-grabbing paperback fronts showcased above. How much is a girl’s virtue worth? A mink coat? A two-carat diamond ring, with husband attached? A fling with an intellectual? A career as a model? Or a flat $100,000 in cash? It was up to Rosalie to choose—it was her virtue at stake. 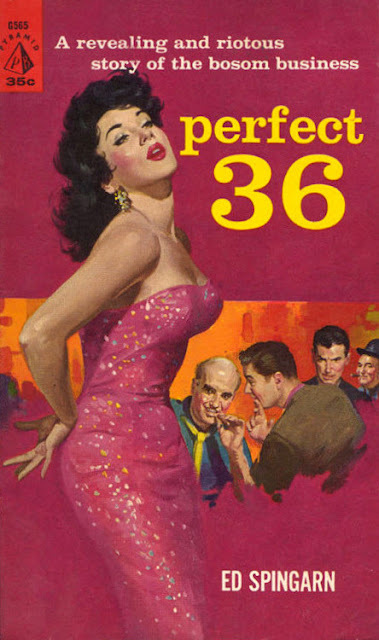 Perfect 36 is the rowdy story of Rosalie—and her figure—and the startling emotions it roused in every male she met! It takes you behind the scenes and screens of the fabulous brassiere trade for the funniest, fastest, most titillating novel of the year! “Titillating,” get it? Yeah, I don’t think the guy who concocted that suggestive copy received (or deserved) a bonus in his paycheck that week. Nonetheless, given the straightforward goal of drawing as many male readers to Perfect 36 as possible, by whatever creative schemes were available, I’m sure he won at least some appreciation from his bosses, and was invited to practice his teaser-penning talents on other novels. (Left) Lou Marchetti’s art for the 1957 edition of Perfect 36. Maguire’s artwork for Perfect 36 was exceptional, yet only slightly less provocative than that façade text, with its beautiful young brunette wrapped in a sparkly, curve-clinging dress, striking poses before an audience of leering gents who you just know aren’t whispering among themselves about her intellectual prowess. Pay special attention to that first guy on the left, the bald-headed one twiddling his cigar … because you’ll find that he, along with a version of the woman holding the limelight on Perfect 36, also appear on this week’s second “two-fer” front, shown above and on the right. Released in 1966, this “Midwood Double Novel” comprises—as the cover line promises—“two stories about the kind of woman around whom no man is safe”: Test in Temptation, by Laura Duchamp; and Cool and Collected, by Blake Randall. It isn’t hard to recognize that the fetching femme Maguire imagined as that “kind of woman” is essentially the same one he’d pictured half a dozen years before on Spingarn’s novel. In this case, however, she’s clad in white, rather than iridescent red; her black tresses are more tossed than before, evidently as a result of her dancing; and her left arm has finally migrated out from behind her back, but the similarities are greater than those differences. 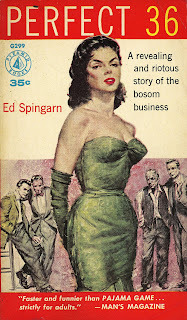 And though the scene around her is more lively and colorful than on the earlier book, the gent (in the lower left corner) most obviously moved by her movements is the same grinning stogie-chomper we saw on Perfect 36, now wearing a light blue shirt and black necktie, rather than a dark blue shirt and a yellow tie. With these protagonists to work from, it’s no wonder Maguire’s Midwood cover coquette looks like somebody capable of handling her own affairs—in more ways than one.